Harriet Tubman is a familiar and revered name in American history. But many are unfamiliar with the details of her remarkable story, the depth of her character, and the inner motivations that drove her. Born into slavery in Maryland in the 1820s, Harriet Tubman's resolute Christian faith would compel her to extraordinary acts of courage and sacrifice. Through her selfless efforts, hundreds of African-American slaves escaped to freedom. 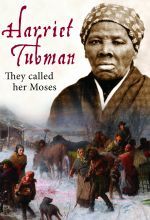 Tubman's tenacious trust in God and love for others earned her the title "the Moses of her people." Discover the real Harriet Tubman in this compelling documentary narrated by Alfrelynn Roberts and featuring expert interviews with leading scholars, including Dr. Eric Lewis Williams of the Smithsonian Institute and Carl Westmoreland of the National Underground Railroad Freedom Center. It also features remarkable early 20th century audio recordings of African-American spirituals sung by former slaves.